Summer Guest Blogger Friday! Very Best Housewife! Happy Friday morning to you! Today's guest post is from a new-to-me blog Very Best Housewife. 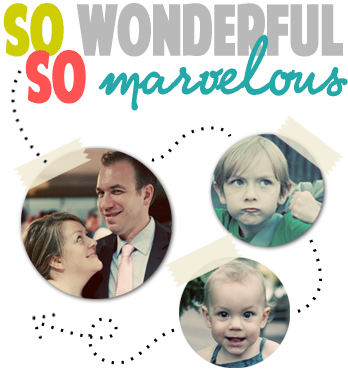 VBH was blog hopping and found So Wonderful, So Marvelous and I'm glad she did. We've been emailing about our mutual giving up Greys Anatomy for the Office and not being able to deal with the gawd awful heat of the south... we're yankee wimps, we know this. She lives in New York state and in the midst of moving has decided to drop everything and do a guest post for you.... really I think she's just slacking off on the unpacking! So go on over and visit VBH, you'll be happy that you did! Oh my gosh you guys, SERIOUS butterflies goin' on right now. This is my FIRST guest post EVER!!! And I'm all kinds of ridiculous and nerdy so I get worked up about uh, EVERYTHING. So, okay....let me wipe my clammy hands off and introduce myself. I am known around these parts as The Very Best Housewife. Maybe it's lame that I'm not telling you my name right now (Michelle knows it! ), but after years of blogging and feeling conflicted I decided it was LAME to not post pictures for fear of being stalked so instead I just don't say names or places. However, you do get to know that I live in NY (and no, I don't mean the city). My husband and I just bought the second house of our marriage, and in it we house our extremely handsome 16 month old son and our extremely overweight cat. I'm neurotic (as if you couldn't ALREADY tell??) and I blame it on two things. 1) I have an addictive personality and I kind of "collect" hobbies and 2) I have quite the over-active imagination so I'm afraid of almost everything, or assume the most ridiculous scenarios are the ones that will happen to me. (Actually...sometimes they do.) Because of that, my blogging is kind of ADD in terms of what I post - covering everything from "what's on my mind", to recipes, crafts, home decor, books, etc etc. Oh and Edward Cullen, because we are secret lovers. That being so, I've had THE hardest time coming up with what to guest-post about. Rather than sit here twiddling my thumbs trying to think of something, I decided to share with you my FAVORITE, EASY summer recipe. My husband & I love this - I make it constantly because it keeps well in the fridge for side dishes for lunches & dinners, and it's a great thing to bring to a picnic or summer get together! So, boil your pasta. While it's cooking, chop up everything else - green pepper, broccoli, tomatoes, olives, cheese, & pepperoni. When the pasta is done, drain and rinse it in COLD water (if you plan to eat it right away so it's not all warm and gross). Mix everything together, squeeze about 3/4 of the bottle of Italian dressing over it, and sprinkle parm cheese & pepper in to your liking. You can chose to drop or add pretty much anything you want (though this is the "perfect" formula I've come up with after many years of playing with ingredients). It's super flexible and obviously EASY! It keeps well in Tupperware or even just a big serving bowl that's covered with plastic wrap or foil. So, friends, there you have it. How'd I do? Was that guest-posty enough? I hope so. The salad sounds delicious....I make one sort of like that but it's always fun to hear what other people add to theirs!! Going to check out her blog right now!! !